SEJONG -- South Korea saw its elderly population grow rapidly over the past decade, while at the same time posting some of the world’s lowest fertility rates. Pundits continue to warn that countermeasures involving social infrastructure fall short considering the speed at which society is aging. Data from the Ministry of Interior and Safety suggest there is an urgent need to map out mid- and long-term policies for the growing proportion of seniors in the nation. As of February 2019 the number of people aged 70 or more reached 5.29 million, according to the government data. People in this age group accounted for 10.2 percent of the total population, which stood at 51.82 million, bringing the proportion of seniors to an all-time high. The number of citizens aged between 70 and 79 came to 3.51 million, followed by those aged 80-89 at 1.54 million, 90-99 at 215,000 and 100 or more at 19,000. Their proportion has increased by 1.8 percentage points compared with five years ago and 3.8 percentage points compared with 10 years ago. In February 2014 there were only 4.29 million people aged 70 or above, and this group accounted for 8.4 percent of the population, which at that time stood at 51.17 million. In February 2009, people aged 70 or above numbered 3.19 million, or 6.4 percent of the population of 49.57 million. During the 2009-2019 period, the nation’s population grew 4.5 percent and the growth of the senior population far outpaced that of the general population. The number of people aged 70-79 increased by 48.6 percent over the cited decade, those aged 80-89 by 108.7 percent, those aged 90-99 by 151.1 percent and those aged 100 or older by 680.5 percent. 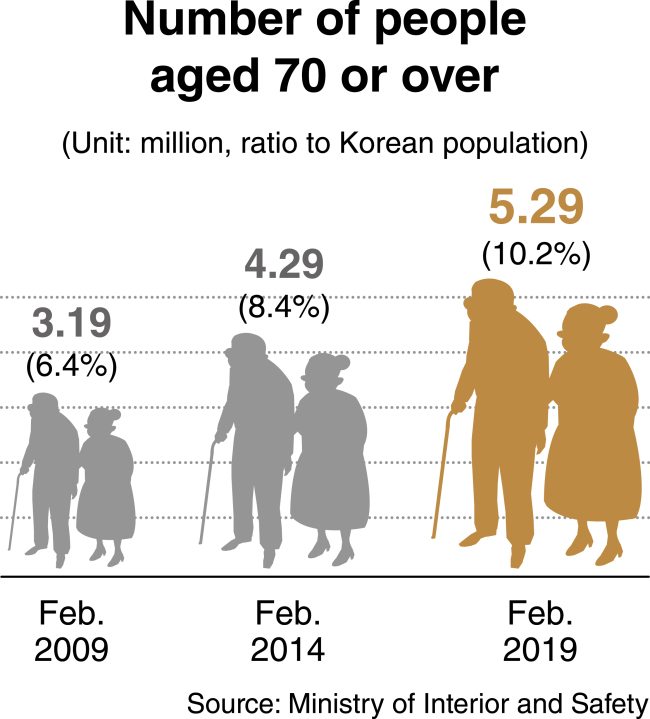 The data also showed that 42.8 percent, or 2.26 million, of the 5.29 million people aged 70 or over resided in the Seoul metropolitan area as of last month. About 1.06 million resided in Gyeonggi Province, with another 951,000 in Seoul and 246,000 in Incheon. Among all the country’s cities and provinces, Seoul topped the list of regions with the highest numbers of centenarians with 5,932. It was trailed by Gyeonggi with 3,706, Busan with 1,697, North Gyeongsang Province with 872, Incheon with 845, South Chungcheong Province with 802 and South Jeolla Province with 781. A foreign office provides consulting services for seniors in this undated photo from an online community. Meanwhile, Statistics Korea includes those aged 65-69 in the elderly population in accordance with the standards of the United Nations. The government agency’s data showed that the proportion of people aged 65 or over hovers around 14.8 percent of the total this year, compared with 12.4 percent in 2014 and 10.8 percent in 2010. Statistics Korea predicts that this figure will exceed 20 percent in 2025 and 25 percent in 2031. Furthermore, the figure can be expected to rise to 30.5 percent by 2037 and 35 percent by 2044. It is also projected that 4 out of 10 Koreans, or 40.2 percent, will be at least 65 by 2058. Over the long term, the agency estimates that the total population will peak at 52.95 million in 2031 and will then drop to 49.79 million in 2049, 47.42 million in 2055 and 43.02 million in 2065. A large portion of experts share the view that the social burden of caring for the elderly, through tax money and other resources, will worsen in the coming years and decades. According to a report from the Korea Economic Research Institute, the nation can expect to see its gross domestic product fall by 0.97 percent every time the proportion of elderly people relative to the total population increases by 1 percentage point. The nation’s working-age population recorded 36.79 million as of 2018, down 63,000 from the previous year. This marked the first decline since 2000, when Statistics Korea adopted a new calculation method. The working-age population is projected to drop further, by 240,000 on-year in 2020 and by 420,000 in 2025. A KERI research fellow mentioned the rising poverty rate among elderly households. “(The government) should expand good-quality jobs for seniors by pushing for flexibility in the labor market,” he said. Starting next year, Korea’s baby-boomer generation -- those born between 1955 and 1963 -- will approach the 65 and older age bracket.